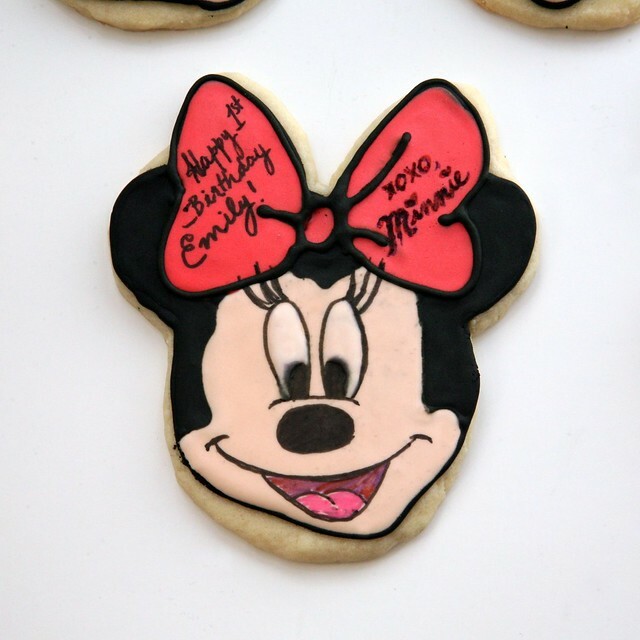 I made some Mickey & Minnie Mouse sugar cookies for Chrissy. We met through our moms, who work together. Chrissy's daughter Emily was turning 1 and had a Minnie Mouse Themed Birthday Party, with a dash of Mickey Mouse, since there were going to be some boys at the party. Chrissy had giant Mickey & Minnie balloon bouquets under big tents plus she made cake pops and Mickey shaped rice krispie treats for Emily's dessert table. Go mama! My mom made the cake (which I unfortunately don't have a photo of, but I saw a picture of it and it was awesome). I made the cookies in SF and shipped them to NY, with extra careful packaging thanks to Cole and super fast shipping thanks to Vicki & Jim. 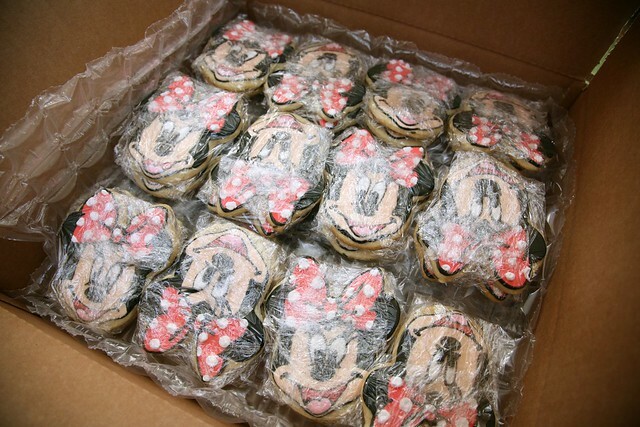 I made about 50 cookies -- 25 Minnie's & 25 Mickey's. Well, 2 extra Mickey's just in case of breakage. 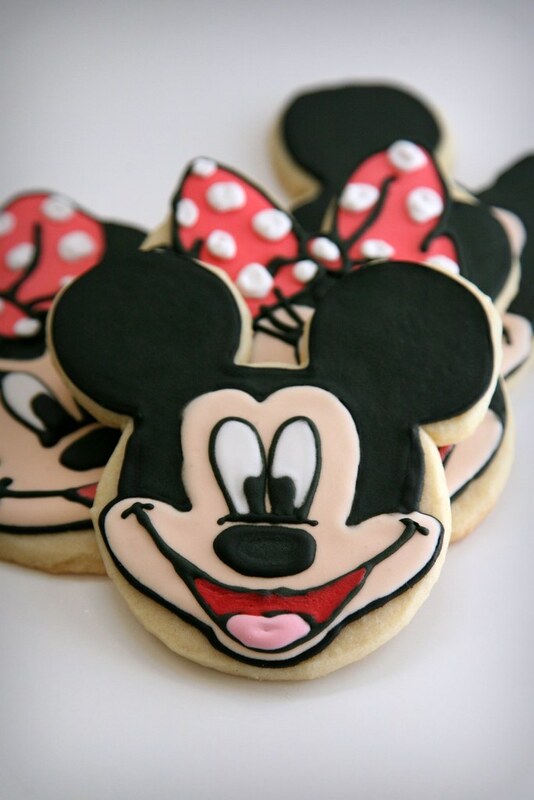 Cole made me custom cookie cutters and graphically engineered the magical Mickey & Minnie facial proportions so that I could copy them precisely when piping the design. 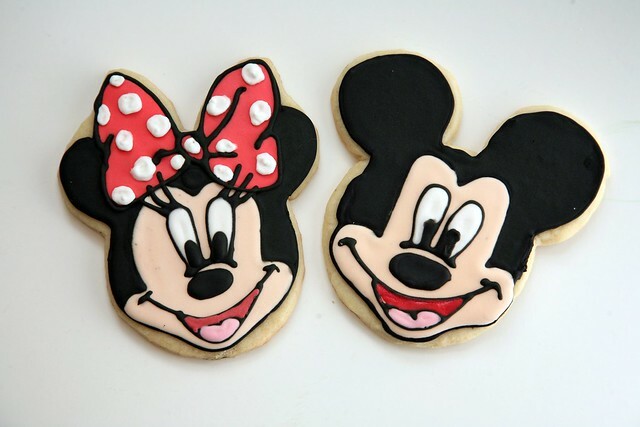 It kinda bothers me when Disney characters look really "off", so Cole helped me see Mickey & Minnie "deconstructed" so I wouldn't be turning out Bobo Disney Cookies. They were all slightly different, but I was pretty satisfied with how much they looked like the real deal. I was ecstatic, though, when I got feedback from Chrissy. I'll just quote her email, because I want to remember this raving review for a long time. Yes, yes I received the cookies and they are beyond incredible. They were above and beyond anything I ever expected. What a talent you have. They are just amazing! They were all perfectly wrapped and in great condition:) i put them on a platter and they look so adorable. I feel so bad b.c i wanted to email you right away but i wasnt near my computer. i sent my mom a txt while at work to tell her that they look like something you would find in the bakery on main street in disneyworld. its like 1:30 am here and i am still getting ready for the party tomorrow, so i apologize for not letting you know sooner they were received. i didnt realize how much i left to the last minute. i cant thank you enough!!! once again, thank you so so much. i havent seen the cake yet your mom made but i hear it is incredible. you are both some team! I made one special cookie just for Emily. 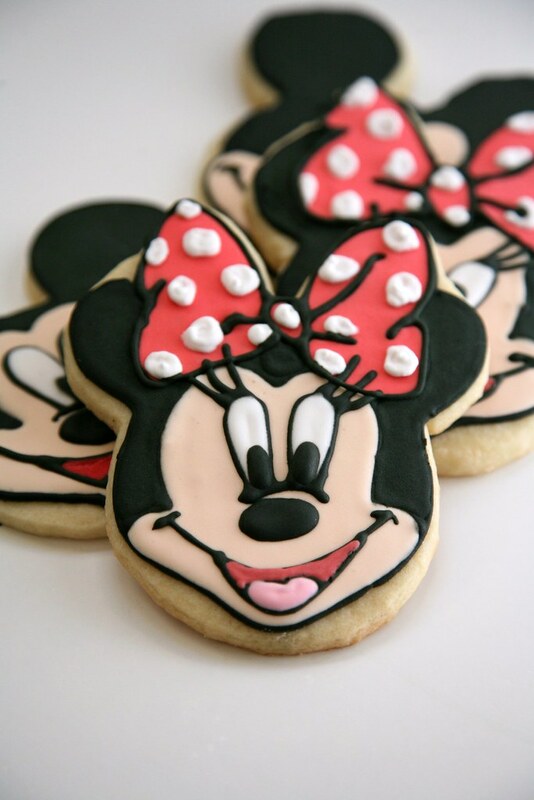 Here's a close up of just Minnie. What a fun project. Made me want to go to Disney World. Thanks, Chrissy, and Happy Birthday Little Emily! !